This is the next book by Paul Tournier that I was able to hunt down in the UW library system. It too is out of print and unavailable as an ebook, but thanks to the interlibrary loan system, I was able to get it shipped from the University of Oregon. 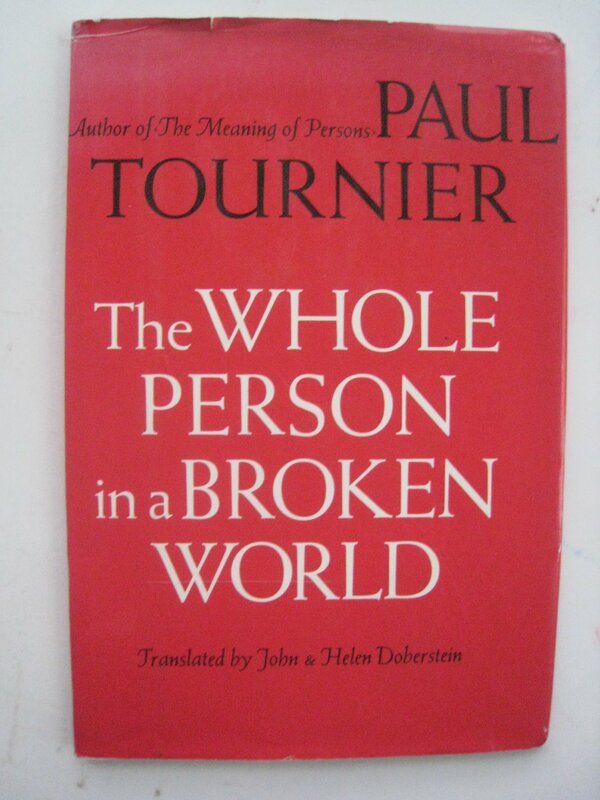 Paul Tournier is a Swiss Christian doctor who did most of his writing during the 1950s. As such, some of the material, especially anything scientific, feels a little dated. But the most profound parts dealing with the Christian life are as relevant as ever. Tournier was a committed Christian, but throughout his work, he acknowledges the shortcomings of his generation, and the Christian churches of his time. And he seeks to do better too. I find myself drawn to this approach: one can simultaneously be an anchored and committed Christian, and acknowledge faults and call for real change. Our institutions are valuable and worthy of preservation, but flawed. They are essential so that we can practice Christianity in real life, serve our neighbors in meaningful ways, and grow together. In Mormon lingo, you can only build Zion in a community. But we also need to be thoughtful about what we can do better. Then comes the age of adolescence. A flood of new knowledge, the intoxication of learning, and the yearning for personal experience confront the adolescent with a thousand problems, which, so it seems to him, his parents escaped. He rises up against them; he revolts. He demands the right to think for himself and not in accord with a system of traditional thought, the right to follow his own opinions rather than the authority of others. He sits in judgment upon his parents and finds they themselves do not practice the morals they inculcate in him. He argues about everything and exults when his parents confess that they have no answers to the insatiable questions he asks. Can we not compare this crisis of adolescence to that which was set off by the Renaissance? My wife laughed a little bit at the analogy, but I felt like it certainly had a lot of explanatory power. It also made me wonder what an adult world would look like. Tournier posited that a mature world wouldn’t necessarily be a return to the Church-dominated world of the Middle Ages, but that it would include a return to acknowledging the centrality of spiritual values and a reconciliation between faith and reason. This is the central problem of the modern world according to Tournier: the separation of the spiritual and the temporal. But Tournier, at least in the book, lays the fault not at secular powers advocating for separation of church and state, but rather at the feet of the churches themselves. They have ceased to seek to engage with the world and the problems of the day, instead relegating spirituality to a small portion of life. Practicing Christians aren’t calling on their faith to address life’s challenges. It has become entirely theoretical, a dead sort of faith. It reminded me of some of the discussion in Kathleen Flakes: The Politics of American Religious Identity in which she discussed the differences between Mormonism and mainline Christianity in America. Christianity had become a denomination that didn’t claim the entire life of an individual, while Mormonism was “a church with the soul of a nation.” When your faith becomes only another key on the keychain of your identities rather than the central organizing force, it is weak. I’m wanting to quote Chesterton here, but I can’t remember the line: he said that we need Christian authors writing about philosophy, science, music, the arts– and not just Christians writing about Christianity. To be the salt of the earth, you need to, well, be in the world. Tournier modeled this very well in his own career, merging his work with patients with his own personal ministry. I am convinced that we today, we Christians, must unite two things which are often opposed but which Christ joined together. On the one hand we must have a clear consciousness of our own unique vocation, our calling to make His voice heard, that voice which alone can provide a true answer to the questions of this tormented world. But at the same time we must guard against making His divine person the subject of division between us and other men, against rejecting them under the pretext that they do not possess the truth which has been given to us. Without concealing anything about our faith, let us seek that which brings us closer to them, that common need for spiritual renewal, even though they may put it in words different than ours. Will the Church be equal to its task in the face of this disquietude of our contemporaries? Will it be able to bring about not a discussion which rebuffs it but rather a living dialogue and fellowship which responds to their confused yearnings? That is the question which haunts me. If we want to help the world in its present crisis, then we Christians dare no longer give the impression that we believe there are two opposing camps: the Christians, to which we belong, and that of the atheistic ideologies, our opponents. We must stop saying to them: Come back to us, for we possess the truth. We must rather say: Let us all turn back to Christ. The Church, it seems to me, has separated itself from real life and thus simply abandoned the world to its practical difficulties and taken refuge in an ivory tower. And for this it bears a heavy responsibility for our present crisis. Tournier is a great model of Christian work, of infusing your career that outwardly is secular in nature with the spirit of the gospel. Christianity is meant to be lived. In this respect, I really think that Paul Tournier would get along very well with Lowell Bennion’s practical gospel. I feel like our own Church is attempting self-correct in the direction Tournier has advocated: the call for more personal responsibility in ministering efforts, the shortening of time spent in church, and the implementation of home-centered gospel study. Hopefully we can fulfill Tournier’s vision of “a living dialogue and fellowship” in the world.